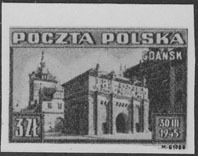 174 EP POLAND (1945) High Gate, Gdansk*. Black print. Scott No 372, Yvert No 452. 182 EP POLAND (1945) Holy Cross Church*. Black print. Scott No 379, Yvert No 460. Views before and after WWII. 2771 EP POLAND (1945) Crane tower, Gdansk*. Black print. Scott Nos 370, Yvert No 450. 2772 EP POLAND (1945) Stock tower, Gdansk*. Black print. Scott No 371, Yvert No 451. 442 EP POLAND (1946) Plane over ruins of Warsaw*. Black print. Scott No C18, Yvert No PA15. 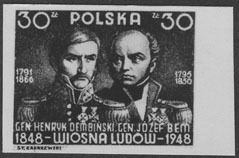 1974 EP POLAND (1948) Generals Dembinski & Bem*. Black print. Scott No 430, Yvert No 510. 1848 Revolution. 2007 EP POLAND (1951) Stanislaw Staszic*. Black print. Scott No 511, Yvert No 608. Leader of Polish Enlightenment. 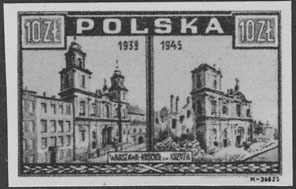 721 EP POLAND (1952) Niedzica Castle*. Black print. Scott No 556, Yvert No 674. 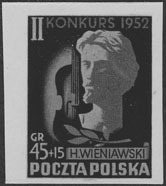 1896 EP POLAND (1952) Henryk Wienawski*. Violin*. Black print. Scott No B98, Yvert No 688. 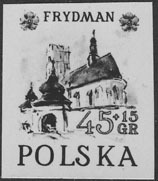 2022 EP POLAND (1952) Frydman*. Black print. Scott No B85, Yvert No 672. 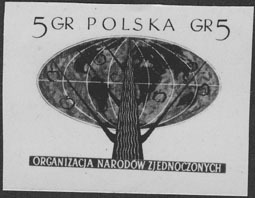 446 EP POLAND (1954) Gliders*. Strip of 3 black prints. Scott Nos 624-7, Yvert Nos 751-5. International Glider Championships. Note that there were only 3 distinct designs, hence only 3 black prints were produced. 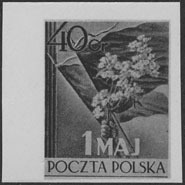 1488 EP POLAND (1954) Flag*. Flowers*. Black print. Scott No 617, Yvert No 744. Labor Day. 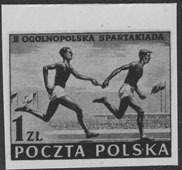 2373 EP POLAND (1954) Relay race*. Black print. Scott No 630, Yvert No 758. Spartakaiad. 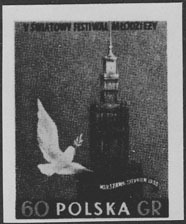 1175 EP POLAND (1955) Dove*. Tower of Palace of Science & Culture*. Black print. Scott No 690, Yvert No 818. 5th World Festival of Youth. 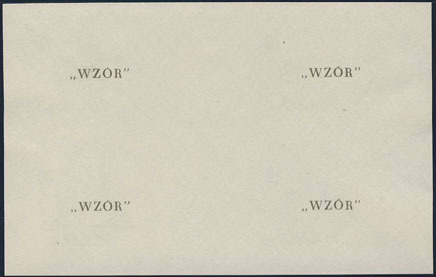 2378 EP POLAND (1955) Hammer throw*. Black print. Scott No 700, Yvert No 828. 2nd International Youth Games. 11520 EP POLAND (1955) Swimmer*. Trial color proof overprinted PROBA (proof). 2nd International Youth Games. L. Schmutz expertization mark on reverse! Scott No 704, Yvert No 832. 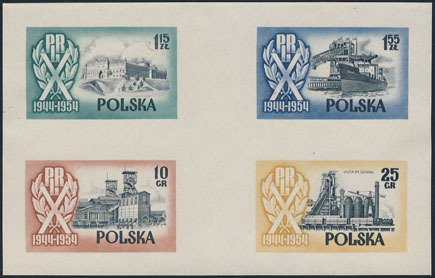 Polish trial color proofs are very scarce! 2827 EP POLAND (1957) Globe*. Tree*. Black print. Scott No 761, Yvert No 885. 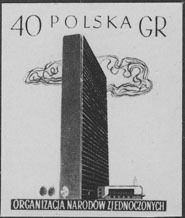 2828 EP POLAND (1957) UN Building*. Black print. Scott No 763, Yvert No 887.